Amatrol’s Pegasus Robotics Simulation Learning System (88-RSS1) teaches the programming and operation of the Pegasus articulated servo robot. The Pegasus simulation software includes powerful 3D graphic simulation tools that reproduce the Pegasus and the workcells in realistic 3D images with dynamic characteristics similar to actual operation. Learners can see four different views of a workspace simultaneously. Solids modeling technology provides a realistic view of program results, including collision detection. The programs simulated in the Pegasus software are the same used by the actual robot. Learners can simulate an application using the software and then transfer that program to the robot for real-world operation. This capability enables multiple learners to effectively share a single robot, a “must” for project-oriented classrooms. The software is Windows compatible and includes a virtual teach pendant, interpreter window for execution viewing, digital I/O handling, and an excellent library of workcell objects. Modern robotic engineers and operators are using this form of graphic modeling to create, test, and extend robotic applications. Virtual Teach Pendant Provides Realistic Experience! The Pegasus simulation software includes a virtual teach pendant that works just like the pendant on the actual robot. The teach pendant includes live keys that are operated by a mouse click and displays update in a realistic manner as if keys are activated. The teach pendant can be used to jog the virtual robot to various positions in the workcell and teach points that can later be used by the program. 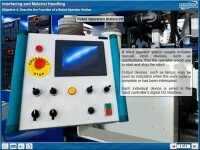 The 88-RSS1 enables learners to simulate the robot in actual workcell applications. It includes dynamic properties such as collision detection and parts that can be manipulated by the robot. The software that actually controls the robot is used in simulation mode to develop programs that can be run in the virtual workcell window. 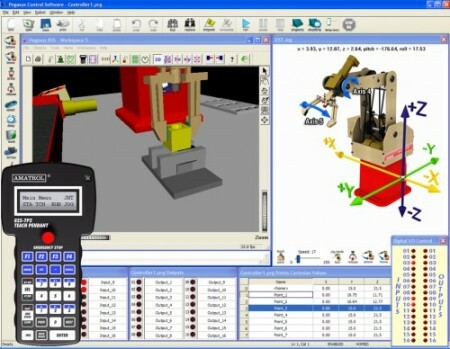 Once the program and robot points are tested and verified in simulation the user can switch the robot control software back into application mode and control the robot, or the program and points can be transferred to another computer for robot operation. Also, programs and points from robots can be opened in simulation for editing and changes. The Pegasus Robotics Simulation Learning System features Amatrol’s world-class curriculum that allows learners to study the theory of robot simulation before directly applying to skill-building activities. Within this curriculum, learners will begin with the basics of robot power up and shutdown, homing, and manual operation, before moving to more advanced topics such as robot programming, material handling, application development, manufacturing cells, and much more! Learners will then practice skills like designing a robot program that uses a servo conveyor virtually within the simulation software or hands-on by transferring the program to an actual robot. Amatrol also offers this curriculum in an optional multimedia that includes audio, stunning graphics, 3D animations, and skill-building interaction to fully engage learners. A sample copy of the 88-RSS1’s Student Reference Guide is included with the learning system. Sourced from the multimedia curriculum, the Student Reference Guide takes the entire series’ technical content contained in the learning objectives and combines them into one perfect-bound book.